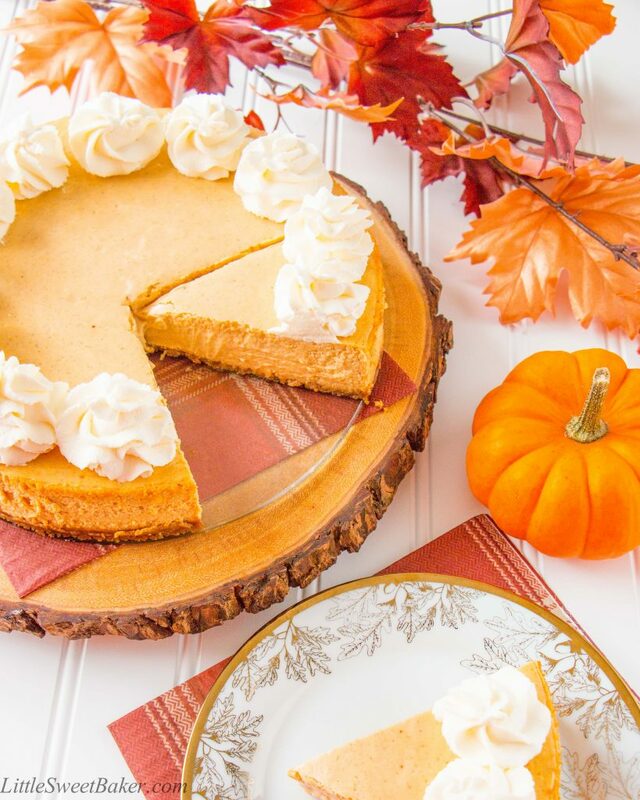 This is the creamiest and dreamiest pumpkin cheesecake you’ll ever make! 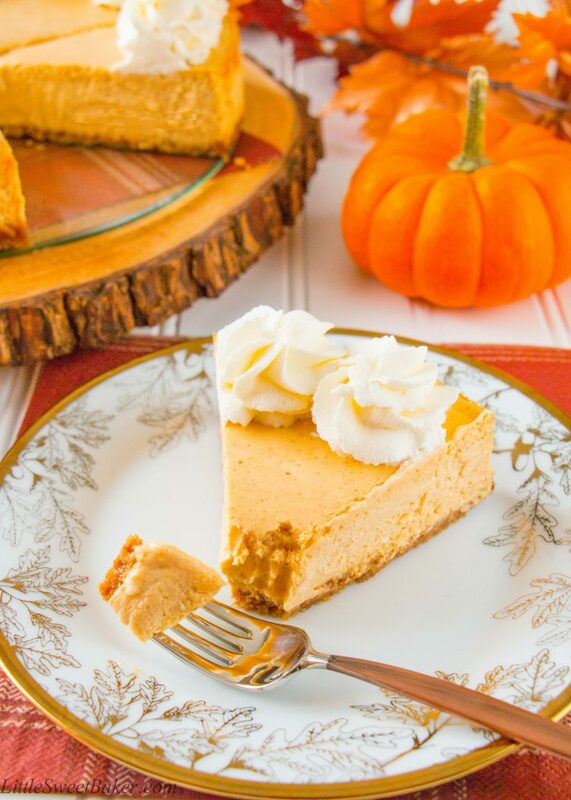 It has a gingersnap cookie crust and is perfectly spiced with cinnamon and cardamom. I hope everyone is glad that the American election is now over, and I hope that most of you are happy with the results. Even though I’m Canadian, we heard all about it up here. Politics is such a touchy and sensitive topic, but I think it’s because most people are just so passionate about the world around them. This election was particularly interesting because there was such a great divide. We will never all agree on politics, so let’s talk about something we can all agree on, dessert. This recipe starts with a spicy gingersnap cookie crust. Now, here’s a great way to get out some frustration, especially if the election didn’t go your way. Place those cookies in a ziplock bag and beat that thing with your rolling pin until you get fine cookie crumbs. Trust me, it will make you feel better about anything that’s not going right in your life. 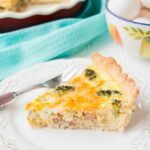 To prepare the filling, you mix the cream cheese with the sugar. Add in the eggs, one at a time, then mix in the pumpkin and spice. Bake all that for about 50 minutes and you have the most fragrant and creamy cheesecake ever! Preheat oven to 325F and set aside a 9″ springform pan. Mix the cookie crumbs and butter together. Press onto the bottom of the springform pan. 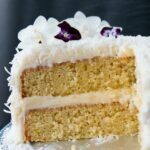 Using and electric mixer, blend the cream cheese and sugar until combined. Add in the eggs, one at a time, mixing well in between. Then add in the pumpkin and spices. Mix again until smooth. Gently pour over crust. Place pan on top of a baking sheet to prevent any drippings from burning onto the bottom of your oven. Bake for 50-60 minutes or until the center is almost set. You want 2-3 inches of the center to still be jiggly because it will firm up as it cools. Run a thin knife along the sides to loosen the edges from the pan. Leave the cheesecake in the pan to cool completely. Then chill in the fridge for a minimum of 2 hours or overnight. Top with some sweetened whipped cream or caramel sauce if desired. 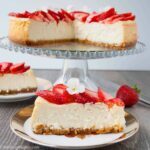 I recently baked this cheesecake for my family reunion and everyone loved it and asked for the recipe so I sent them all the link to this blog page. Thank you for sharing! You’re very welcome Charlotte, and thank you for sharing by blog with your family. I appreciate it! 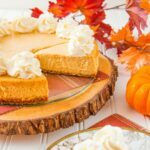 Pumpkin cheesecake? it sounds amazing! Very perfect to relax for the holidays, with a cup of tea and a book – definitely pinning! What a pretty looking cheesecake and I love the flavor profile as well. Thanks for the great recipe idea! I made my own pumpkin purée by cooking pumpkin cut up into pieces with milk, cardamom, ground nutmeg and some cinnamon. I also reduced the amount of sugar by about 100 grams. The cheesecake is very tasty! You’re welcome:) Now that’s a true chai. I still have a pumpkin kicking around from Halloween. I think I’m going to have to try your version. Thank you for your feedback and have a lovely day. We always have pumpkin pies for Thanksgiving and my family also loves cheesecake. I am bringing pies this year – maybe it’s time for a change. Yumm! 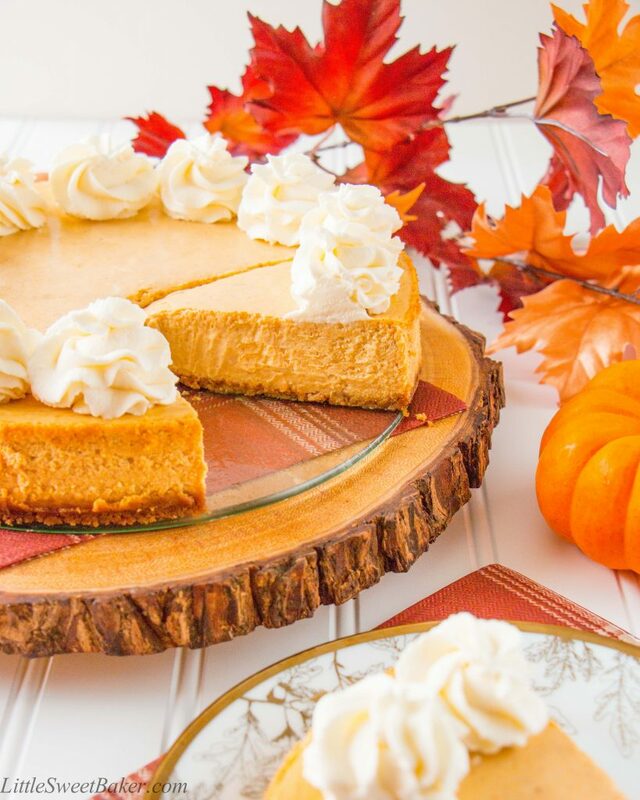 This does looks like the perfect pmpkin cheesecake 😀 Happy FF! There are no eggs listed in the ingredients. This looks absolutely amazing! Definitely craving some right now. Happy Fiesta Friday, btw. This is soooo delicious, Lily! I love pumpkin anything, so I am going to make it! A brilliant tip to use the crumble making as a way to let out some frustration! I think the whole world stopped breathing for a while and now we will just have to wait and see! The cheesecake looks very smooth and I love the sound of cardamon in it as well! As always, such an enticing looking pie!